“Salesmanship” is one of the greatest skill sets you’ll ever learn. When developed, the skill set of selling has unbelievable power to propel your business (and your life) in a powerful direction. Yet, sales skills aren’t typically taught in school, in college, or in a fitness certification course. And that’s a real shame. By not teaching you how to sell, our educational system and certifying organizations leave you with the impression that sales “just automatically happen” when you do a good job delivering results for your clients. The reality is… that’s just not the case. Sure, you can (and will) create a “buzz” about your services by being good at what you do, and getting referrals are an offshoot of that “buzz.” But if you assume that these referrals will just walk up to you, hand you their wallets, and automatically purchase packages of training sessions or group classes (and commit to the length of time required to reach their goals with your program), then I’m sorry to say, "You’re living in fantasy land!" Who just walks up and throws money at you? When you’re ready to get serious about growing your business, then you must commit to learning and mastering the skill set of “salesmanship.” You must commit to mastering it with the same intensity and commitment to discipline that you would in learning how to coach a new fitness skill or movement. Understand that salesmanship is a skill set of communication that must be learned and mastered like any other skill set in your professional career development. Review the 7.5 steps recommended for effective sales communication. Understand how to stay in control of a sales conversation and direct your prospect to success. 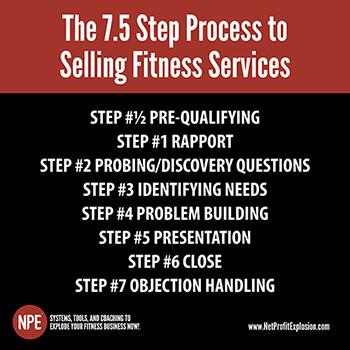 Learn how to master the steps to selling fitness services so you can close a sale. A common mistake most fitness professionals make is thinking that good sales people are “born.” Often, you’ll hear people make comments like, “If you’re good at talking, then you’ll be good at selling,” or, “If you’re a ‘people’ person, then you’ll be good at selling.” Well, very often the complete opposite is true. To be good at selling, you must be better at listening than you are at talking. Because ultimately that is what a good sales person does. You must listen to the needs of your prospects and help them gain clarity on the problems they want to solve, or the goals they want to achieve. After that, it’s just a simple matter of presenting them with the appropriate solution and… tada! A sale is made! That’s what sales really is: Connecting your prospect with the solution he or she is already looking for. Don’t foolishly think that you create demand. That’s silly. Your prospect already has an emotional desire, and your job is to simply help them gain clarity on what it is, why it’s important, and how to fulfill that desire by investing in your program. The system involves seven defined steps. Think of them as your roadmap. When you learn the points on the map, then you have a reference point to always know where you are, at any given point in time, throughout the sales process. Ok, I mentioned that the system involves seven steps. Actually, it involves seven and a half because there is a half-step that must occur before you get face-to-face with a prospect. Failure to complete this step will only result in your frustration and lost revenue. I can’t tell you how many fitness professionals we’ve trained on this system who, every once-in-a-while, skip this step and it comes back to bite them later. These folks know better. So, pay attention here. This is important! The two most common objections you’ll ever receive when selling fitness services are, 1) “That’s too expensive” (price objection), and 2) “I need to talk it over with my partner” (spouse objection). You have the power to overcome these objections before you ever meet with a prospect by making sure to address them upfront in the half “Pre-qualifying” step. First, describe your program, give your prospect a price range for program, and then just ask the simple question: “Is that within your budget?” If the answer is yes, great! Continue on with the pre-qualifying process. If the answer is no, then offer information about a lower priced program you provide (like group training or program design), or refer them to someone else. There is no value in wasting your time (or your prospect’s time) in meeting for a consultation when they can’t afford your services - even if they like your program and everything you have to offer. The second most common objection is: “I’ve got to talk it over with my husband/wife” (the partner objection) and this should be addressed after you’ve already established whether your program is within the budget range that your prospect can afford and is comfortable investing in. Mrs. Jones, when many of our current clients first made the decision to join our program they preferred to review the information with their spouse or family member. And frankly, we encourage it because having a good support system at home is important to making a lifetime commitment to your health and fitness goals. So, may I ask if you like our program and we have a good fit, or is there anyone else involved in the decision of you joining our program? Closing is not something you do to someone. It’s an opportunity you give them. That above qualifying statement and question allows your prospect to feel comfortable admitting to you whether investing in your program is a joint financial decision in their household. Which is great! You want to get that on the table up-front, before you even begin your consultation or ever try closing a sale. Having a spouse or family member involved in the decision of signing up for a fitness program is essential because making lifestyle changes and having a good support system at home ensures that your client gets the best results from the program and your services. The “bonus” to all this is that ,with both a husband and wife in front of you for a consultation, you can show them that you’re professional and really care about helping them achieve their health and fitness goals. Then, there's an opportunity for, and likely that, both of them will sign up for your program. Now you’ve just doubled your sale and helped them support each other in their programs; while instilling the lifestyle changes necessary to achieve (and keep) great health and fitness results. Commit to properly pre-qualifying a prospect before every single consultation (whether they called you on the phone or just walked in to a facility for more information) so you can set yourself up for sales success - right from the start. First, your appearance: Look the part. Don’t show up sweaty having just finished a workout, in a cut-off t-shirt, and then expect your prospects to feel comfortable forking over a big chunk of money to you. If you want to earn top dollar, you’ve got to look top dollar. Think about a golf-pro or high-level tennis coach who gets paid $150+/hour. Consider dressing in similar attire – a nice shirt with a collar and decent shorts or pants. Imagine walking into an attorney’s office and he or she is wearing jeans and a t-shirt. Would you feel comfortable giving them your money? Or are you more comfortable hiring another attorney dressed in appropriate business attire? All things being equal, you’d say the well-dressed professional. They took the time to look the part. Same goes here. Second, smile! : It’s such a simple thing to do and it sets the tone for your prospect's experience. Look your prospect in the eye, smile and greet them. It’s probably the easiest thing you can do, and it goes a very, very long way. Then simply ask your prospect a couple simple questions like, “Welcome, Mrs. Jones. Did you find the gym/health club/studio alright?” Then engage them with conversation. If you mention something that came up in your initial pre-qualification phone call, even better. Remember the “little details” they may have shared with you on the phone and reference them if you can. This shows you actually listened to them and remembered the conversation; which instantly separates you from just about every other service provider out there today. After you’ve established good rapport with your prospect, and made them feel comfortable, it’s time to begin your probing/discovery questions. This is the most time consuming portion of a consult, and you shouldn’t rush it (but you do want to control and direct it). You’re going to be asking a series of questions about your prospect's goals, motivation, level of commitment, current exercise and nutrition habits, etc. You’re going to be asking each question, and then allow your prospect to do all the talking. It’s very important you learn how to become a great listener. One of the many benefits of selling in the face-to-face environment is you can gather a lot of information by not only listening to the words your prospect uses when answering your questions, but also recognizing the tone of voice and watching body language. There are a thousand different ways someone can say something and answer a question. They can be leaning forward or sitting back (leaning forward indicates engagement). They can have their arms open or folded across their chest (folded arms indicate a defensive position). And they can be looking at you or looking off to the side of the room (eye contact indicates interest and engagement - and that’s what you want and need to make a sale!). Just watch a good actor vs. a bad actor in a Broadway show. Timing and delivery of our words mean everything. You’ll be able to gather a lot of information by watching and listening to your prospects. Then, as you become a master at the selling skill set, you’ll learn how to fine tune your questions and subtle points of the consultation based on the live feedback you’re receiving from your prospects. The most important aspect of this step is that you make sure to, as we say in selling, effectively “peel the layers of the onion.” You should dig down in your questioning until the prospect reveals the emotional reasons why they truly want to solve a problem or achieve a goal - because that’s the "fire" inside us all and behind everything we do - our emotions! Goals without emotion behind them are virtually meaningless. For you to best serve your prospect and client you should really understand what makes them tick. A very important component in being a great coach is not only mastering the technical knowledge of teaching movement, but learning how to help your clients get the best out of themselves. As a fitness coach, you play a vital role in motivating, supporting, and holding your clients accountable to accomplishing the action steps required for achievement of their goals. Getting to know and understand them helps you better sell your program, motivates them to buy your program, and helps you work together with them to accomplish the goals and objectives you’ve established for them. Identifying needs is a simple, but critical, step in the sales process. We refer to it as "holding up the mirror." As a fitness professional, you most likely work with numerous clients and have a pretty good idea of someone’s needs when you sit down for a consultation. Most clients have the same general needs. They’ve most likely been eating poorly, not exercising (or not exercising correctly), and now they’ve gained some weight. They want to lose some fat, build some muscle, and achieve a better level of health and physical fitness. However, a big mistake almost every fitness professional makes is they assume that because they understand a client’s needs, the client will inherently understand their own needs. After all, it’s pretty obvious, right? Not the case. If you make that assumption, you're setting yourself up for failure. Most of your prospects have “blinders” on. They don’t really understand their needs because they’re not looking at their situations objectively or through the same filter of knowledge and experience that you have. So you’ve got to help them "see the light." This is the most important step of all. If you want to ensure a successful consultation, master this step. Because without a problem (or a very weak problem), it’s very difficult to establish any type of value to the solution or program you are presenting. This is an area I spend a lot of time training on. I use a defined script and role play, role play, role play. The better you become at building the problem as a sales professional, the easier it is for your prospect to jump… no, run!... to your solution and buy what you’re selling. Get this right, and closing a sale is easier. Get this wrong, or do it halfway, and closing a sale is like pulling teeth. So, what does this tell you? If you want to become really good at selling, invest in your training on the right system, and then practice, practice, practice. Top performers in any endeavor (business, sports, etc.) commit to studying and mastering the skill sets required for success. If you want to become a good sales professional, then you’ve got to commit to studying and mastering this essential step of the sales process. I recommend that your presentation be visual. I use a pre-made PowerPoint template that’s ready-to-go. Why? Because it’s been proven in study after study that having a visual aid in your sales presentation can increase comprehension by as much as 400%. That’s a huge impact and you want to take advantage of it. It’s akin to listening to a radio program vs. watching a television show. Words on paper (like you’re reading right now) are nothing more than lines that imprint to an established meaning in your brain. Words on paper are, in fact, images that aid in a visual presentation. Before we had language and books to communicate, our ancestors had pictures on the walls of caves. In a very general sense, not a whole lot has changed in the best form of communication over the evolutionary process. If your prospect is going to buy your program/services (and remember when you sit down in front of a qualified prospect for a consultation, your job is to sell your program), then you’ll be well served to do everything in your power to clearly communicate what you sell. Most people have no idea what “hiring a coach or personal trainer really means.” You should not only clearly illustrate and explain this in your presentation, but also "prove your case" as to why your program is unique and different from other solutions - as well as why your prospect should do business with you! Closing is the easiest step of all. Anything you’ve heard about closing being difficult, or having to be a "tough closer" to be a good salesperson, is nonsense. Closing is not something you do to someone. It’s an opportunity you give them. You offer them the opportunity to grab the solution they want and buy what you sell. When it’s done right, the closing process is effortless. It’s simply a natural extension of your sales process. I teach what’s called the “alternate choice close.” You give your prospects a choice to go with "X" or "Y" as the appropriate solutions to solve their problems or achieve their goals. This is a very easy close for both you and your prospect. It allows your prospect to feel great about the purchase because you didn’t force anything on them. They got to make the choice to buy. You tossed them the lay-up, and they got to dunk the ball. Well, Mrs. Jones I’d recommend either 'X' or 'Y', with 'X' being the better value for full commitment upfront. Which is best for you? Keep in mind: "X" may be the more expensive program option, but has better value in terms of price per session. Another very important point on objection handling is that the best way to master the process is to better train on steps: #½ (pre-qualification) and #4 (problem building); which will eliminate almost any objection from coming up in the first place. Alright, we’ve covered a lot of ground here. But I hope you’ve walked away from reading this with a much better understanding of what it takes to improve this area of your business. Allow me to share a couple things with you here: Track your consultations for a month and look at all your lost sales. You’ll find (and we’ve done the research over thousands of consultations from all over the world) that the top objections are: 1) Price, 2) Spouse, 3) Think it over (which is not really an objection, but more of a stall), and 4) Purchasing a low end package (which isn’t really as serious an objection, because it’s still a sale). Learning how to handle this fourth objection is important because, when your prospect fully commits to the length of time required to accomplish goals upfront, he or she will do better and you’ve made a bigger sale. So, it’s important to train on each of these steps and know how to handle them every time. When you prepare yourself for what’s going to happen, and you train on how to handle the situation upfront, then there will never be prospect who "rattles" you. You’ll stay in full control of the sales process. Use this knowledge to master selling and effective communication. Doing so won’t just allow you to grow your income, but it allows you to help more people and make a difference in the lives of all the clients you touch. Remember: nothing happens until you make a sale! 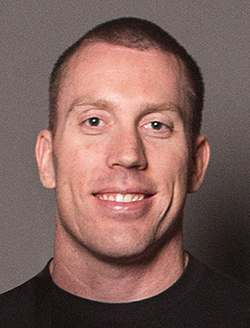 Sean Greeley, CEO and Founder of NPE, has an unrelenting passion for empowering fitness business owners to grow their business and create the life they want. Since 2006, NPE has served 45,000+ fitness business owners in 96+ countries and is an award-winning company with offices in Los Angeles, London, and Sydney. Advanced Fitness Sales Training (Part 1 of 3): Who’s Charging What? And Why? Can Your Business Survive the Off-Season?